Sometimes, you may not want to see the program and file icons on your desktop, for example, when you’re taking a screenshot in which your desktop can be seen. 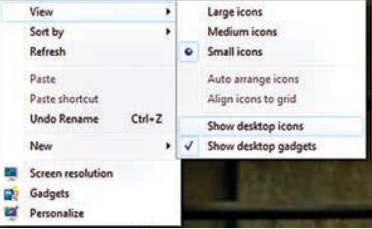 If you wish to be able to hide your desktop icons for a short time before taking a screenshot, click on the desktop with the right mouse button and, in the context menu, remove the check mark in front of the item ‘View | Display desktop icons’. All the icons will now disappear. As soon as you have taken the required screenshot, you can make the icons visible again by resetting the check mark you removed before. No files or folders will be affected in the process.